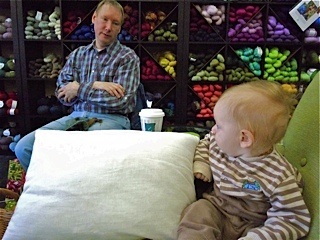 Last week when I was at A Grand Skein my buddy Finn and I took a brake from out knitting and had a nice conversation. 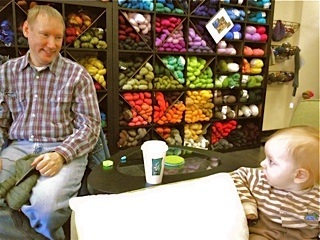 Okay I was knitting and he was nursing, but you get the idea! Gloria, his mother, propped him in the corner of the couch and he had his little elbow up on the arm and just stared at me! It looked like we were having a nice talk. He is such a cutie! I'm involved in many crafting hobbies and I am always immensely outnumbered by women. It's nice to have a fellow guy there, even if he is only 6 months old. He looks like a cutey. We need to get him together with Gabby. They would make a cute couple with their red hair.